What's In a Name? Ask the Washington Redskins. Names define us as human beings, individually and collectively. No name, no identity. No clear understanding of who we are in the world. When a baby is born the first act of the new parents is to name that child, give them a clear moniker by which they will be known from that day forward. Names matter. A lot. To imagine otherwise, that a name is “just” a name, a mere word or a harmless descriptor seems to me either incredibly naive or incredibly tone deaf. Which brings me to the National Football League’s Washington Redskins, based in our nation’s capitol. 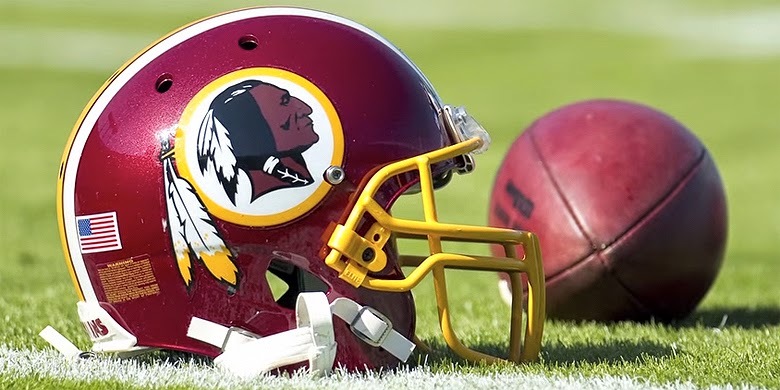 The Redskins are under increasing pressure from Native Americans, politicians, journalists, NFL players and even some fans to change their name for one simple reason. “Redskin” is an offensive, derogatory and racist term to large numbers of Native Americans, who see it as an ugly stereotype at best, hate speech at worst. Last week this debate intensified when the United States Patent and Trademark Office cancelled the team’s five trademark registrations, ruling that these violated the Lanham Act, a 1946 federal law prohibiting trademarks that “may disparage or falsely suggest a connection with persons, living or dead, institutions, beliefs.” In other words the term “Redskin” and the symbols connected to it are insulting to Native Americans. But apparently Redskins’ ownership won’t budge on this issue. In a widely quoted USA Today article from a year ago, team owner Dan Snyder said, "We will never change the name of the team....It's that simple. NEVER — you can use caps." I’m not sure why Snyder and so many others still ignore the hurtful and nasty reality of “Redskin” as a mean and even cruel term to Native Americans. Is it about the money, profits associated with that pro team? Is it about tradition? This is just who we are, always have been, always will be! Is it a backlash against so called “political correctness”? Folks just need to get over it. It is just a name, right? Yet would anyone cheer the use of other racial or ethnic terms or skin colors to name a sports team? Can you or I imagine cheering for the Baton Rouge Brownskins or the Seattle Yellowskins? How about the Jacksonville Jews or the Boston Micks, a term derisive to Irish folks like me? I hope not. That’s not just acceptable. So why is it ok to give a social pass to names which insult a whole group of Americans? It’s not just the NFL which needs to look at this issue. Hundreds of high school, college and pro teams across the U.S. still use Native American names and mascots. Go to an Atlanta Braves game and you get to do the tomahawk chop. Check out the image of “Chief Wahoo”, the logo for baseball’s Cleveland Indians. And yes, I know that when many of these team names were adopted long, long ago, it may not have been done in a spirit of insult. I get that. But it is 2014. America has changed. What once passed as “normal” and socially acceptable racial and ethnic stereotypes: these are now taboo, and rightfully so. Why this last holdout? This final hanging on to a so-called “right” to names which so clearly are viewed by fellow Americans as painful? There are 566 Native American tribes in the U.S. with 5.2 million members. Don’t they deserve some respect and dignity too? As a person of faith, one of the most important spiritual ideals my religion teaches is empathy: the ability to put one’s self in the shoes of another person and by doing so to see life through their experience. This is what I know. If I was talking to a Native American friend, would I ever look them right in the eye and call them a “redskin” to their face, especially if I knew it would insult them? Would you? I’d like to think not. So why is it still ok to use language which so clearly is experienced as harmful by others? It’s not up to the government to solve this problem. It is up to you and me and sports fans to be the ones who call for a change. A large group of our fellow neighbors and citizens asks that we as a society no longer use imagery or names which they experience as racist and hurtful. For me, it is that simple. It is that clear. Feeling Merely Average in Life? Join the Club. It's official. I'm an average guy. As a 53 year old, I now claim membership in a very big group of American women and men. In 2014, to be 53 is to have the fourth most common age in the United States, according to the U.S. Census Bureau. True, I did come in behind some of my younger friends, who are even more ubiquitous in number. The top three age groups by population in the U.S. are 22 year olds, followed by 23 year olds and then 21 year olds. The least common age is one hundred years old and above. There I'm not so average, at least tangentially for my grandfather is still going strong at 100 years plus. Yet still I do have to face into this one hard fact. Most days I'm just not all that special, not really one of a kind or very unique, at least statistically speaking. I live where 82 percent of Americans also live, in an urban area, close to a major city. I drive an eleven year old car, just slightly more decrepit than the average U.S. vehicle which is still going after a full decade. Irish, I live in the second most Irish county in the country. Balding, I join half of my fellow males in mourning that hair loss. Even my faith in God is pretty common. Those who claim a Christian affiliation make up 78 percent of the U.S. population. So I'm average and I think I'm ok with that. For to be average in America...well, it is not so easy sometimes, in a culture which so often tries to convince us that our worth as humans is in fact tied to being above average, right? To never be quite satisfied with where we are in this life or what we have or what we do for work or where we live. If we live in a little house we are supposed to get into a bigger home, right? Move on up, even if that mortgage payment is a stretch, because who wants an average house?! Drive an old jalopy like my 171,000 mile trusty Toyota, and I'm supposed to get the latest model, for I am what I drive and I can’t be zooming around in my fading average rust bucket. Apply for college but only an "elite" school will really do. If you get into a "second tier" school or even worse a public university, you must be disappointed at being so average. And are we really doing enough for our kids? Just one more class, one more sport, one more commitment and then I'll be an above average Mom or Dad! Some days it feels like our communal ethos is this: be above average always, no matter what it takes and no matter what the toll this effort exacts. It's not that our striving is bad. It is good to try and be the best that we can, to have that hope for our loved ones, to reach our full God given potential and use the gifts we have been given by our Creator. That's our life call as children of God. What worries me is the spirit of nagging discontentment and chronic restlessness which can underlie our frantic efforts to be above average, to get ahead, to pull in front of the pack, to always race forward. What I fear are communal and inner voices questioning, critiquing, judging. Is good enough ever really good enough? In this state of mind and heart? No. Instead be anything you want but just don't be ordinary, or common, or average. But here's the rub. 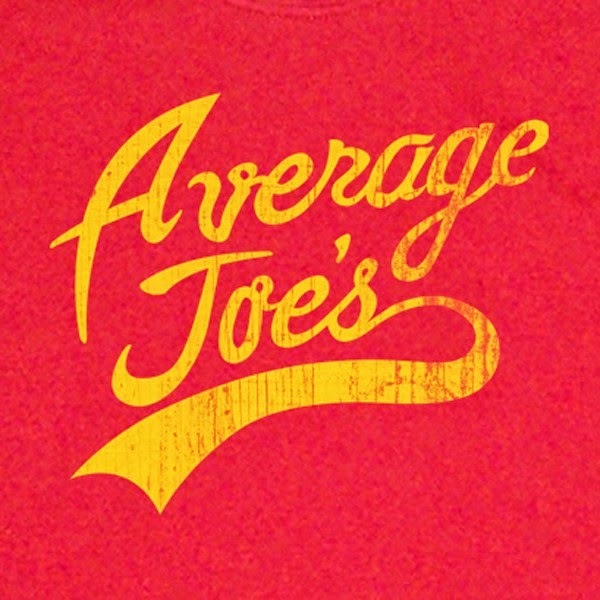 Most of us are just that: average and that will never, ever change. Average. That's the nature of the math and the statistics and the reality of living. Most of us live in the middle of life, neither soaring so high in the clouds nor stumbling way down below. On average we're a little overweight. On average we make mistakes every single day. On average our grades put us in the middle of the bell curve. On average our kids are doing ok. On average we're middle managers, weekend athletes, and dwellers in a nice Cape with a used car in the driveway. So today, on this average June morning, as I write these words which most likely will not be my best, nor my worst, I'm ok with being average. I think God's ok with that too. If Jesus Came to Boston, Could He Afford the Rent? Some days…these days? They are strange days. At least for me. This past weekend I and group of folks from the church I serve drove twenty five miles into Boston to serve dinner at the Pine Street Inn, the largest homeless shelter in the city. On a sticky and sultry spring evening we dished out plates of rice, beans and chili to 225 people, as they made their way through the bread line. Living in the suburbs it’s not very hard for me to forget about the thousands of poor in our state, like those hungry men we fed. They can seem invisible, someone else’s problem, mere statistics, or perhaps worst of all, an accepted norm in the rough and tumble world of economics. 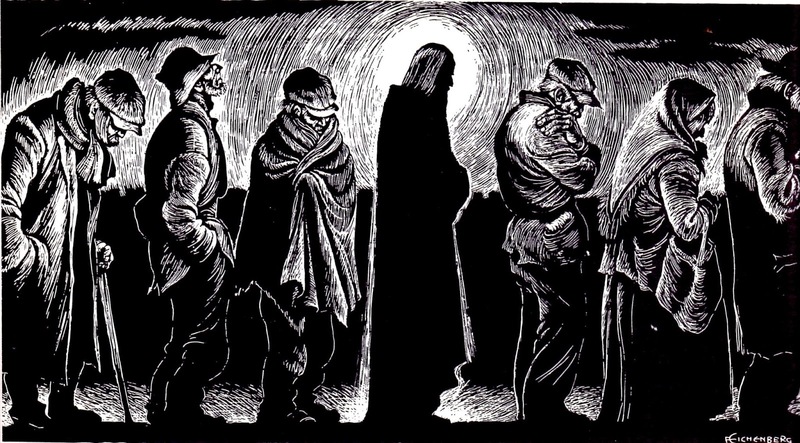 Jesus did say that the poor will always be with us, right? Yet here’s the strange thing. As we made our way to the Pine Street Inn, we drove by so many high rise luxury apartment buildings under construction, their cranes dotting the city skyline. Boston is undergoing an unprecedented building boom in elite housing. In the next three years 8,000 luxury rental units will go on the market. Those who can afford to pay will have the privilege of calling the Hub their home. How costly? Wow. For a one bedroom abode. Is it just me or does that seem like an awful lot of money? The rule for housing expenses is that your are only supposed to spend 1/3 of your salary on shelter so to make the rent you’d have to be pulling down something like $144,000 a year for the Avalon or $75,000 for that Allston efficiency. All this while rents in Massachusetts are the sixth highest in the United States. Forty-one hundred Bay State families live in shelters or motels every single night. Section 8 housing, which helps poor and working folks pay the rent, has a waiting list of 95,000 Bay State folks. Then my time in the city last Sunday night got even stranger. 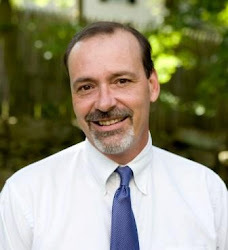 As I was serving supper, I looked up at one of the Pine Street Inn guests and came face to face with someone that I know, a funny and smart and sensitive young man. We exchanged smiles and small talk, and then he took his tray and made his way to a table at the back of the vast dining room. I’ve no idea how he ended up there. I didn’t ask. He didn’t say. I hope the meal was good. I wonder where he slept that evening. I worry about where he might be today. At the Boston Common, on a bench. In Harvard Square, hanging out by the “T”. At another city soup kitchen. To believe in a God of mercy is both a gift for the comfort it brings, and a challenge for the comfort it asks us to give others. God always declares that no matter where we live, in a comfy suburb or on a mean urban street, we cannot turn away from those in need, like my friend. It is always tempting, normative even, to get so caught up in our life dramas, that we forget the world’s forgotten. I’m as guilty of that as anyone. It was an absolutely perfect, God blessed and God given moment. One which was never before. One which will never happen again. Within that time, I didn’t want to be anywhere else. And then…it was gone, forever. The moment? 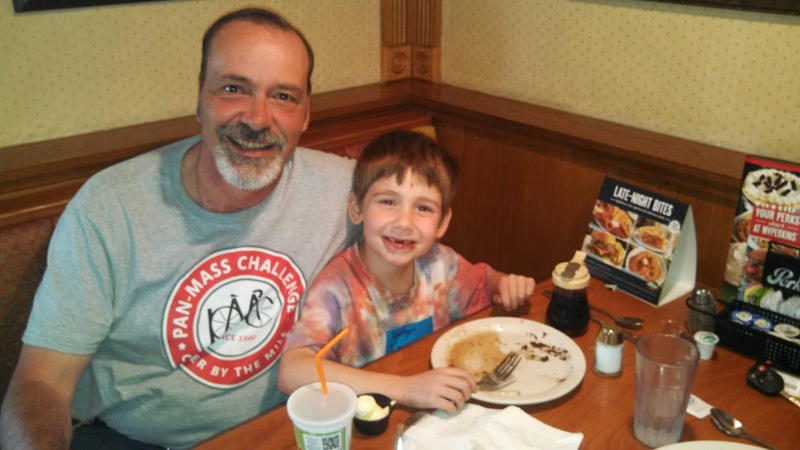 A Saturday morning breakfast of chocolate chip pancakes, with my six year old Goddaughter Bridget, at a suburban Midwest family restaurant in a strip mall. Not exactly gourmet offerings or a five star location. The toll house bits were melted and gooey on the flapjacks and ended up smeared across her smiling face too. The tabletop was covered with sticky remnants of maple syrup from diners long gone. Our waitress was kind and sweet as she served us on that bright and warm May day, just three weeks ago. She snapped a photo of us two, a moment frozen in place, captured for all time, but firmly anchored in just one time. I visit Bridget and her family each year and this time she insisted we have a special outing together, just the two of us, and so I told her to pick anywhere she wanted to go for brunch. We ate and she talked to me about the life of a kindergartner, her friends at school, how t-ball would start soon, the summer camps she was excited to attend. And then in a little under just one hour, it was all over. When you eat breakfast with a hungry kid, there’s no lingering. Before I knew it Bridget had gobbled up all her pancakes and washed it down with a large glass of cold chocolate milk. Hey—if you’re going to do chocolate, fully commit! And then we were off to the used bookstore, to browse the stacks and find a good story for later that day. An undeniably perfect moment. And it will never, ever, ever happen again. Not in that exact way. Not in that exact place or at that precise time, May 24th, 2014, 10:35 to 11:30 am. Bridget and I will never pass that way again. We “lived” there, in that slice of time and then it departed and faded away to memory. Tempus fugit. But what a time. Time is among the oddest and most vexing and mysterious of human constructs and gifts from our Creator. We can’t contain time or stop it or slow it down or speed it up and all the technology in the world cannot alter this fact. As time finite beings, we are ruled by time, all the time. Our bodies age and our kids grow. Seasons change. The world revolves. Days go by and the months and the years too. “Wasn’t it just yesterday I was rocking Bridget to sleep in my arms, pushing her in the stroller around the neighborhood so she’d fall asleep?” Wasn’t it just a moment ago you went to kindergarten, or you watched your son toddle off into that big classroom for the first time, or you shed a tear of pride and gratitude watching your daughter graduate from college or walk down the wedding aisle or feed her new baby? All perfect moments. But moments nailed to specific times. Time flows on. We float along in its inexorable stream. See that beautiful scenery along the river? Pay attention. In a moment it will be lost in time. So: are we awake to, aware of, alive within, all these precious and perfect moments, like my chocolate chip pancake moment? I’m not so sure. The arrogance and sin of modernity tempts us to believe we can have it all and even worse, we can do it all, and all in, and all on, time, time. In fact, time be damned. We can work too much and play too little and not pay the price. We can rush, rush, rush from one event to another in an insane marathon of games and parties and practices and rehearsals and deadlines and meetings and fit it all in, right? We wear the badge of “busyness” like a medal. I can’t remember the last time someone asked me, “How are you?”, that I did not automatically answer, “Wicked busy!”, or offer a similar response. And so instead of being right here, right now, in this one perfect moment, too often we run. We sprint, thinking that if we just go fast enough, time won’t catch up to us. Well guess what? Time always wins. Always. And the saddest regret at life’s end, when all our time runs out? “I wish I had spent more of my time….” Only you can fill in that blank. But today there is more time, 24 hours, 1,440 moments to be exact. If we are blessed enough and wise enough to understand this fact, maybe, just maybe, one of those moments will be absolutely perfect. Like a pancake breakfast on a Saturday morning.